Here’s a video about the turbulence models available in Autodesk Simulation CFD. Everyone simulates the airflow over a soccer ball, but what about the airflow over a soccer stadium? More CFD in sports: Formula-1 is reducing the allowable CFD usage in 2015 from 3o to 25 teraflops. A very brief overview of the use of CFD to simulate airflow in the trachea and main bronchi. And an even briefer blurb about CFD and environmentally friendly cars. Very cool video of a simulation of a long-duration EF-5 tornado. Click image for article. The 3rd International Workshop on High-Order CFD Methods will be held 3-4 January 2015 in Orlando, Florida in advance of the AIAA SciTech Conference. If you intend to participate they’d like an email by 30 June for use in planning the event. Abstracts for presentations are due by 15 October. Abstracts for the NAFEMS World Congress 2015, to be held in San Diego in June, are due 17 November. Congrats to Tecplot for being named to the list of 100 best companies to work for in Seattle on the strength of their executive leadership (#19 in the mid-size category). Pointwise’s own Travis Carrigan has his master’s thesis research included in Wind Turbine Technology from CRC Press. CFD simulation for the purpose of evaluating pedestrian comfort. Click image for article. More CFD goodness from the folks at Stanford. They released v0.1 [not a typo] of HiFiLES for Large Eddy Simulation. Virginia Tech’s Eric Paterson shares a slide deck on meshing for OpenFOAM. Scan & Solve 2014 for Rhino is now available. CD-adapco released STAR-CCM+ v9.04 including concurrent per-part meshing and the ability to evaluate CAD robustness. For more GPU news read about the addition of OpenCL support to NX NASTRAN. Looking for free CAD? Here are 10 to choose from. Tesla uses Exa PowerFLOW to evaluate aerodynamic performance in yaw. Image from SAE. Click image for article. I am here to defend IGES’ honor. Whereas PADT advises that IGES be your last choice for geometry import into ANSYS I’ll say that you should feel confident about using your IGES with Pointwise. IGES is actually a pretty good format for sharing 3D geometry. (I am not alone in this opinion.) The format is well defined. It’s ASCII meaning that it’s readable. It takes very little time to become familiar with how an IGES file is laid out. The problem with IGES files is that people write them in ways that explicitly violate the standard. One particular egregious violation is the definition of trimming curves. The file writer sets a flag that indicates whether the curves are defined in XYZ space or in the UV space of the surface being trimmed. That flag is often set incorrectly and the file reader goes to look for one type of curve or the other and can’t find it. Another example is the use of a string of points (what IGES calls copious data) to define a trimming curve. Unfortunately, that’s explicitly disallowed by the standard. The result is that the file reader has to not just code to the standard but has to robustly handle non-standard files, a practice known as “flavoring” your IGES reader for files that come from specific sources (an IGES reader for CATIA, an IGES reader for Pro/E, etc.). You may infer that we have done a lot of that but we hide the flavoring under the hood. To clear up some confusion, the IGES standard does include support for solid models, the so-called B-Rep Solid Model Object (entity type 186). So if you have a CAD system that will export solid models to IGES as 186s your reader should be able to import them. In addition, we have implemented something (that works for all CAD import, not just IGES) that automatically assembles surface geometry into a solid (regardless of whether solid data exists in the file). On top of that, we’ve implemented something called quilting which is the ability to assemble multiple CAD surfaces into a single meshable region based on geometric feature lines. Keep in mind also that when talking about CAD interoperability issues we need to distinguish between various error sources. One is accurate reading and writing of the file according to its specification. Another is the dreaded issue of tolerances and how they effect trimming and assemblies. Yet another is representation – how your CAD kernel represents a particular surface type may be different than how it is represented in the file you export to and different still from the way it’s represented in the system that must import it. So learn to love IGES and we’ll all be happier. Interior designers are really embracing facets. First WoodSkin, then JOIN-Facet, and now LivingSculpture, a 3D modular ceiling installation consisting of individual quad OLED lights that can be arranged in a custom 3D shape and controlled interactively via an iPad. Read more about LivingSculpture here and be sure to watch the videos. [Note: The page is written in French.] My office is going to get really cramped if I keep getting all this stuff. Also note that this is a logical extension of a 1970s era mirror ball. 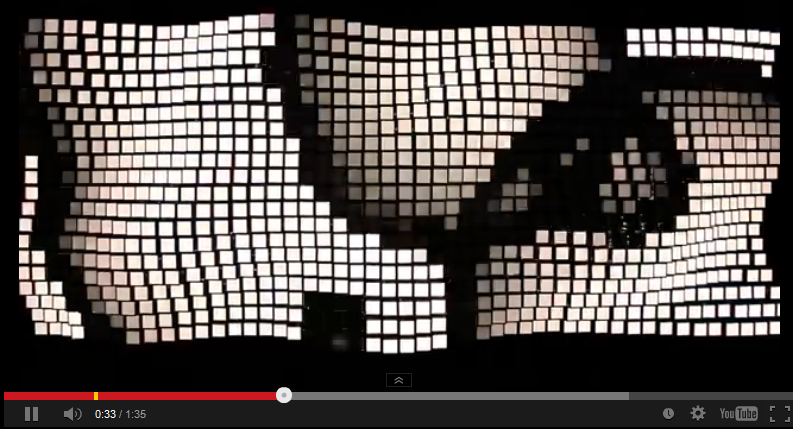 LivingSculpture 3D Modular OLED system. Screen shot from a video of the lights being manipulated interactively. This entry was posted in Applications, Hardware, News, Software and tagged ANSYS, Autodesk, CD-adapco, Exa, GPU, mesh generation, NAFEMS, Nastran, NX, OpenFOAM, PowerFLOW, PumpLinx, Scan&Solve, Simerics, STAR-CCM+, Tecplot, turbulence, visualization. Bookmark the permalink.